How to write a narrative: Step -by-step instructions, Planning tools, video tutorials, writing prompts and teaching ideas for English teachers, students and parents. Story writing resources. Good narrative writing skills are hard won by our students. They build on, and encourage the development of, a good grasp of the mechanics of writing. They also require the development of an additional skill set however, namely the ability to tell a good yarn. Telling stories is as old as humanity. We see and hear stories everywhere and on a daily basis. From having a good gossip on the doorstep with a neighbor in the morning, to the advertisements that bombard us from billboards and radio on our daily commute. Much is made of the art of storytelling, but luckily for us, and our students, weaving a good tale is a craft too and crafts can be taught, practiced, and perfected over time. Here we will look at some of the main elements that comprise a good story: setting, characters, problem, climax, and resolution. And we will look too at how best we can help our students understand these elements, both in isolation and how they mesh together as a whole. Narratives are a popular genre for students and teachers as it provides the writer with an opportunity to share their imagination, creativity, skill and understanding of nearly all elements of writing. On occasion we refer to a narrative as 'creative writing' or story writing. Unlike other genres of writing narratives consist of many sub genre's, such as these. Maximise your narrative writing sessions by spending approximately 20 percent of your time planning and preparing. This ensures greater productivity during your actual writing time as well as keeping you focussed and on task. Use tools such as graphic organizers such as those found below to logically sequence your narrative if you are not a confident story writer. If you are working with reluctant writers try using prompts to get their creative juices flowing. Spend the majority of your writing hour on the task at hand, and don't get too side tracked editing during this time. When editing a narrative read it for three elements. Finally, get someone else to read it. Take on board their feedback as constructive advice. The use of graphic organizers, planning tools and writing checklists will greatly assist the planning and editing time. In this section activities and events involving your main characters are expanded upon. These events are written in a cohesive and fluent sequence. Your complication is resolved in this section. It does not have to be a happy outcome however. Whilst orientation, complication and resolution are the agreed norms for a narrative there are numerous examples of popular texts that did not explicitly follow this path exactly. Use descriptive and figurative language that will paint images inside your audiences minds as they read. Narratives can be written from any perspective but are most commonly written in first of third person. Narratives frequently switch from narrator to first person dialogue. Always use speech marks when writing dialogue. If you change tense make it perfectly clear to your audience what is happening. Flashbacks might work well in your mind but make sure they translate to your audience. Although narratives can take many different forms and contain multiple conflicts and resolutions nearly all fit this structure in way or another. Some of the most imaginative tales occur in a most common setting. The setting of the story often answers two of the central questions of the story, namely, the where and the when. The answers to these two important questions will often be informed by the type of story the student is writing. The setting of the story can be chosen to quickly orientate the reader to the type of story they are reading. For example, a horror story will often begin with a description of a haunted house on a hill or on an abandoned asylum in the middle of a woods. If we begin our story on a rocket ship hurtling through the cosmos on its space voyage to the Alpha Centauri star system, we can be fairly certain that the story we are embarking on is a work of science fiction. Such conventions are well worn clichés true, but they can be helpful starting points for our novice novelists to make a start. Having the students choose an appropriate setting for the type of story the student wishes to write is a great exercise for our younger students. It leads naturally onto the next stage of story writing which is the creation of suitable characters to populate this fictional world they have created. However, older or more advanced students may wish to play with the expectations of appropriate settings for their story. They may wish to do this for comic effect or in the interests of creating a more original story. For example, opening a story with a children's birthday party does not usually set up the expectation of a horror story, and indeed it may even lure the reader into a happy reverie as they remember their own happy birthday parties. This leaves them more vulnerable to the surprise element of the shocking action that lies ahead. Once the student has chosen a setting for their story, they need to get started on the writing. There is little that can be more terrifying to English students than the blank page and its bare whiteness that stretches before them on the table like a merciless desert they have to cross. Give them the kick-start they need by offering support through word banks or writing prompts. If the class is all writing a story based on the same theme, you may wish to compile a common word bank on the whiteboard as a prewriting activity. Write the central theme or genre in the middle of the board. Have students suggest words or phrases related to the theme and list them on the board. You may wish to provide students with a copy of various writing prompts to get them started. While this may mean that many students stories will have the same beginning, most likely they will arrive at dramatically different endings via dramatically different routes..
A complete unit of work on narrative writing for teachers and students. NO PREP REQUIRED. Teach your students to write creative narratives and stories through proven methods of character creation, plot development, researching and writing skills. ALL CONTENT, RESOURCES AND ASSESSMENT TOOLS INCLUDED. There is a bargain at the centre of the relationship between writer and reader. That bargain is that the reader promises to suspend their disbelief as long as the writer creates a consistent and convincing fictional reality. Creating a believable world for the fictional characters to inhabit requires the student to draw on convincing details. The best way of doing this is through writing that appeals to the senses. Have your student reflect deeply on the world which they are creating. What does it look like? Sound like? What does the food taste like there? How does it feel like to walk those imaginary streets and what aromas beguile the nose as the main character winds their way through that conjured market? Give consideration to the when, is it a world of the future where things are cleaner and more antiseptic? Or is it an overcrowded 16th century London with human waste stinking up the streets. If students can create a multi-sensory installation in the reader's mind then they have done this part of their job well. Monty Burns - A classic Villain first and foremost who can also display a more complex and warm side when required. Now that your student has created a believable world, it is time to populate it with believable characters. In short stories it is important that these worlds are not overpopulated beyond what the skill level of the student can manage.For the most part, short stories usually only require one main character and few secondary ones. Think of the short story more as a small scale dramatic production in an intimate local theater than a Hollywood blockbuster on the grand scale. Too many characters will only lead to confusion and become unwieldy with a canvas this size. Keep it simple! Creating believable characters is often one of the most challenging aspects of narrative writing for students.Fortunately, there are a few things we can do to help students here. Sometimes it is helpful for students to model their characters on actual people they know. This can make things a little less daunting and taxing on the imagination. However, whether or not this is the case, writing up brief background bios or descriptions of characters’ physical on personality characteristics can be a very useful prewriting activity. Students should give some in-depth consideration to the details of who their character is: How do they walk? What do they look like? Do they have any distinguishing features? A crooked nose? A limp? Bad breath? Including small details such as these bring life and therefore believability to characters. Students can even cut pictures from magazines to put a face to their character and allow their imaginations to fill in the rest of the details.. Younger students will often dictate to the reader the nature of their characters. For students to improve their writing craft, it is important they know when to switch from story-telling mode to story-showing mode.This is particularly true when it comes to character. Encourage students to reveal their character’s personality through what they do rather than merely by lecturing the reader on the faults and virtues of the character's personality. It might be a small relayed detail in the way they walk that reveals a core characteristic. For example, a character who walks with head hanging low and shoulders hunched while avoiding eye contact has been revealed to be timid without the word once being mentioned. This is a much more artistic and well-crafted way of doing things and less irritating for the reader. A character who sits down at the family dinner table and immediately snatches up his fork and starts stuffing roast potatoes into his mouth before anyone else has even managed to sit down has revealed a tendency towards greed or gluttony. Again, there is room here for some fun and profitable prewriting activities. Give students a list of character traits and have them describe a character doing something that reveals that trait without ever employing the word itself. It is also important to avoid adjective stuffing here. When looking at students early drafts adjective stuffing is often apparent. To train the student out of this habit, choose an adjective and have the student rewrite the sentence to express this adjective through action rather than telling. This is often the area apprentice writers have the most difficulty with. It is important that students understand that without a problem there is no story. The problem is the driving force of the action. Usually in a short story the problem will center around what the primary character wants to happen or, indeed, wants not to happen. It is the hurdle that must be overcome. It is in the struggle to overcome this hurdle that events happen. Often when a student understands the need for a problem in a story their completed work will still not be successful. This is because often in life problems remain unsolved. Hurdles are not always successfully overcome. Students pick up on this. We often discuss problems with friends that will never be satisfactorily resolved one way or the other and we accept this as a part of life. This is not normally the case with writing a story. Whether a character successfully overcomes his or her problem or is decidedly crushed in the process of trying is not as important as the fact that, one way or the other, it will finally be resolved. A good practical exercise for students to get to grips with this is to provide them with copies of stories and have them identify the central problem in each through discussion. Familiar fables or fairy tales such as Three Little Pigs, The Boy Who Cried Wolf, Cinderella etc are great for this.. While it is true that stories often have more than one problem or that the hero or heroine is unsuccessful in their first attempt to solve a central problem, for beginning students and intermediate students it is best to focus on a single problem, especially given the scope of story writing at this level. Over time students will develop their abilities to handle more complex plots and write accordingly..
4. Climax: The How Things Come to a Head! tension provides your reader's a reason for continuing. The climax of the story is the dramatic high point of the action. It is also when the struggles kicked off by the problem come to a head. The climax will ultimately decide whether the story will have a happy or a tragic ending. In the climax two opposing forces duke things out until the bitter (or sweet!) end. One force ultimately emerges triumphant. As the action builds throughout the story suspense increases as the reader wonders which of these forces will win out. Climax is the release of this suspense. Much of the success of the climax depends on how well the other elements of the story have been achieved. If the student has created a well-drawn and believable character that the reader can identify with and feel for then the climax will be more powerful. The nature of the problem too is essential as it determines what's at stake in the climax. The problem must matter dearly to the main character if it is to matter at all to the reader. Have students engage in discussions about their favorite movies and books. Have them think about the storyline and decide what were the most exciting parts. What was at stake at these moments? What happened in your body as you read or watched? Did you breathe faster? Or grip the cushion hard? Did your heart rate increase or did you start to sweat? This is what a good climax does and what our students should strive to do in their own stories. Often, after the climactic action, a few questions will remain unresolved for the reader, even if all the conflict has been resolved. The resolution is where those lingering questions will be answered. It may be that in a short story the resolution will only be a brief paragraph or two. But, in most cases it will still be necessary to include as an ending immediately after the climax can feel too abrupt and leave the reader feeling unfulfilled. Be sure to check out our own complete guide to writing perfect paragraphs here. An easy way to explain resolution to students who are struggling to grasp the concept is to point to the traditional resolution of fairy tales, the “And they all lived happily ever after” ending. This weather forecast for the future allows the reader to take their leave. Have the student consider the emotions they want to leave the reader with when crafting their resolution. While usually the action is complete by the end of the climax, it is in the resolution that if there is a twist be found it will appear - think of movies such as The Usual Suspects. To pull this off convincingly usually requires considerable skill on the part of student writer, but it may well form a challenging extension exercise for those more gifted storytellers among your students. Once students have completed their story they can then go back and edit for grammar, vocabulary choice, spelling etc. but not before! As mentioned, there is a craft to storytelling. as well as an art. When accurate grammar, perfect spelling, and immaculate sentence structures are pushed at the outset they can cause a storytelling paralysis. For this reason it is important that when we encourage the students to write a story we give them license to make the mechanical mistakes in their use of language that they can work on and fix later. Good narrative writing is a very complex skill to develop and will take the student years to become competent in. It challenges not only the student’s technical abilities with language, but also her creative faculties. The use of writing frames, word banks, mind maps, and visual prompts can all give valuable support as students develop the wide-ranging and challenging skills required to produce a successful piece of narrative writing. But, at the end of it all, as with any craft, practice and more practice is at the heart of the matter. Set the scene and engage your audience early with well thought out characters and setting. Introduce a problem or complication that causes an issue which gives your story purpose. Entertain us. Narratives are the most popular of all styles of writing. If you can't entertain and engage us you audience will quickly move on. The single biggest challenge many students face when it comes to story writing is coming up with inspiration or ideas to get those creative juices flowing. Some students will have more ideas than hours in the day and others will always struggle for both ideas and direction. It is essential that you have a range of tools, strategies and resources at your disposal to ensure you get the most out of your writing time. You can find some examples of these prompts at the bottom of this page. Narratives entertain and engage the reader in an imaginative experience. Narrative texts are organised according to setting, event leading to a problem and solution. The main features of narrative writing are: defined characters, descriptive language, past tense. An introduction – This includes “who, what, where” information. Who is in the story? What is happening? Where is the story set? 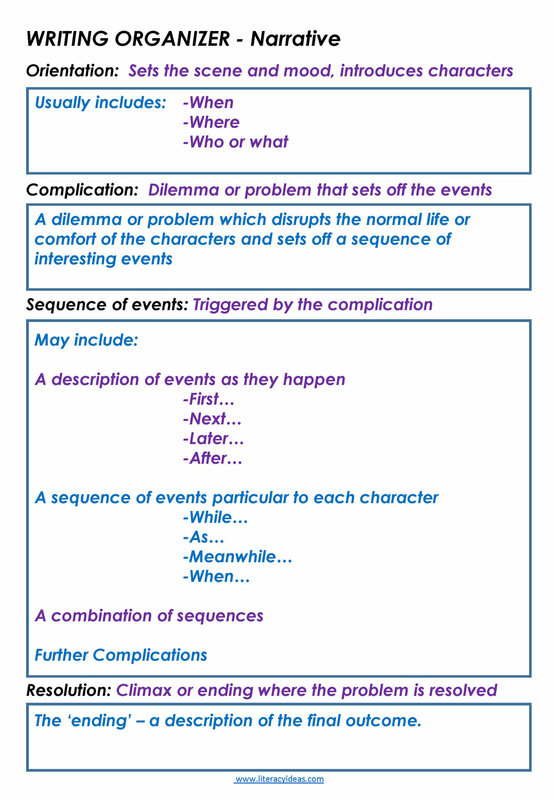 A complication – Narratives usually have some kind of problem for the main characters. A series of events – Several events happen in the story as the main characters attempt to solve the problem. A resolution – The complication is solved. A conclusion – The narrative finishes with a concluding paragraph to sum up the story for the characters. A Moral – Sometimes the characters in the narrative learn a lesson, or a moral, about life. I would strongly recommend that when story writing you use your time effectively to get the most out of your students without burning them out. I could recommend you keep your writing time to an hour at most and you may wish to structure it like this to ensure it has purpose. Be sure to to share and discuss these infographics with others. Although the purpose of these infographics is designed to sell a story more than tell it the principles apply the same in the classroom. Click on an infographic to enlarge.